President Ilham Aliyev’s interview with REAL TV on February 12. Screenshot from REAL TV’s YouTube channel. How often should a country’s leader give interviews to the local media of that country? Once a week? Once a month? Rulers of authoritarian countries might sometimes settle on a very controlled interview with state media once a year or less. The answer to this question in Azerbaijan is quite extraordinary. 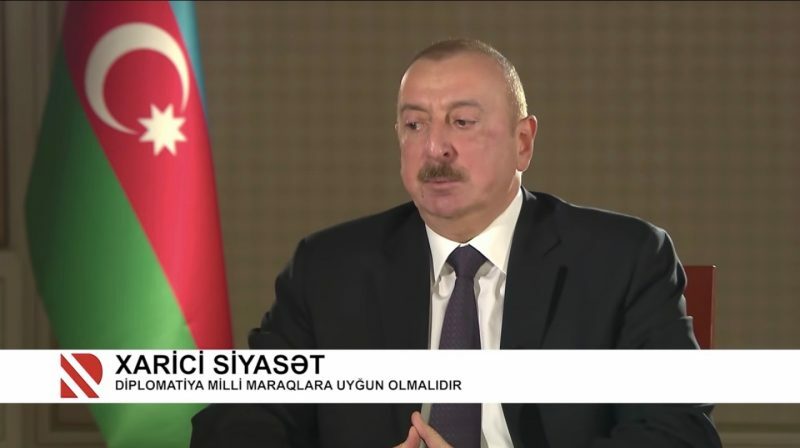 Earlier this month, President Ilham Aliyev, who became Azerbaijan’s leader in October 2003, gave his first-ever interview to local television. The hour-long February 12 interview with pro-government journalist Mirshahin Aghayev — once known for having a more independent stance — was broadcast on the privately owned pro-government broadcaster REAL TV. It aroused significant interest in Azerbaijan, where citizens are used to listening to Aliyev make speeches but unaccustomed to seeing him discuss ideas with an interlocutor. Even Aliyev’s Twitter account comes across as a bizarre monologue rather than an attempt at public outreach. In the end, however, the interview proved an underwhelming debut. Many on social media commented on the president’s understated body language, somewhat dazed appearance and a reliance on state media talking points. Given that Aliyev does not have to impress anyone — Azerbaijan has never had a free and fair election in its 27-year independence — why did he bother to do this? The topics of the interview broadly mirrored those highlighted in state media — the long-standing conflict with Armenia over Nagorno-Karabakh, public services, economic reforms and Azerbaijan’s relations with the Eurasian Union and European Union trade blocs. No new insights were provided. After the video received a host of negative comments like “Resignation” and “No more tales are needed” in addition to dislikes during its first day online, REAL TV’s YouTube channel closed comments. Opposition politician Azer Gasimli said the interview showed the government was “very worried” amid stewing public dissatisfaction and a sluggish economy. I watched Ilham Aliyev’s first interview with a local journalist. I think it is meaningless to say or write something in response to what the President said. Because we have responded to him for many years. The interview was not sincere. Both the President and the journalist remind me of “ships floating on a lie”. My conclusion: the government is very worried! The only thing I learned was “Grandma Saray”. I’m sure that this “grandma” would say something more interesting than Ilham Aliyev. 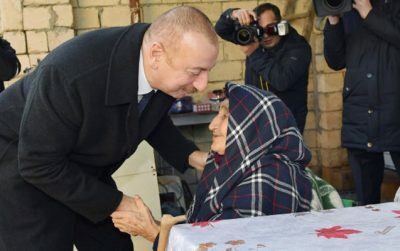 Muntazir’s reference to “Grandma Saray” addresses Aliyev’s visit to the Shamakhi region of Azerbaijan, where an earthquake destroyed several homes earlier this month, including one belonging to a 92-year-old woman called Saray. State propaganda had seized on Aliyev’s meeting with Saray, who has since been celebrated as a model citizen for her stoicism and faith in the future of the Azerbaijani state after the quake. Ilham Aliyev meets with Grandma Saray. Photo from qafkaz.info. Another independent journalist, Sevinc Osmangizi, staged a call in canvassing reactions to the interview on YouTube immediately after the interview was broadcast. Viewers mostly registered their disappointment and called for change.